Cape Canaveral Air Force Station Space Launch Complex 40 (SLC-40), previously Launch Complex 40 (LC-40) is a launch pad for rockets located at the north end of Cape Canaveral, Florida. The launch pad was used by the United States Air Force for 55 Titan III and Titan IV launches between 1965 and 2005. After 2007, the US Air Force leased the complex to SpaceX to launch the Falcon 9 rocket. As of December 2017[update], there have been 36 launches of the Falcon 9 from the complex. The site was heavily damaged following the September 2016 Amos-6 incident, due to a catastrophic failure during a static fire test. The complex was repaired and returned to operational status in December 2017 for the CRS-13 mission. Space Launch Complex 40 with Titan rocket mobile service tower in 2008, prior to demolition to prepare for the construction of the SpaceX Falcon launch pad. The first launch from SLC-40 (initially named LC-40) was the maiden flight of the Titan IIIC (June 18, 1965), carrying two transtage upper stages to test the functionality of the vehicle. A total of 26 Titan IIICs, 8 Titan 34Ds, 4 Commercial Titan IIIs and 17 Titan IVs were launched between 1965 and 2005. 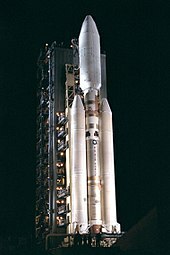 The final Titan launch from SLC-40 was the Lacrosse-5 reconnaissance satellite carried on a Titan IV-B on April 30, 2005. The tower was disassembled during late 2007 and early 2008. Demolition of the Mobile Service Structure (MSS), by means of a controlled explosion, occurred on April 27, 2008, by Controlled Demolition, Inc.
LC 40 with SpaceX Falcon 9 launch infrastructure, February 2015. The four towers surrounding the rocket are lightning rods. On April 25, 2007, the US Air Force leased the complex to SpaceX to launch the Falcon 9 rocket. During April 2008, construction started on the ground facilities necessary to support the launch of the SpaceX Falcon 9 rocket. Renovations included installation of new liquid oxygen and kerosene tanks and construction of a hangar for rocket and payload preparation. The first Falcon 9 rocket arrived at SLC-40 in late 2008, and was first erected on January 10, 2009. It successfully reached orbit on its maiden launch on June 4, 2010, carrying a dummy payload qualification unit. SLC-40 is the launch facility of the SpaceX Dragon, a reusable automated cargo vehicle which is currently being used to provide two-way logistics to and from the International Space Station; a role previously filled by the Space Shuttle until its retirement in 2011. SpaceX successfully launched the first test flight for the Dragon from SLC-40 on December 8, 2010. Its first attempt to launch to and dock with the International Space Station successfully occurred on May 22, 2012, following an abort after engine ignition three days earlier. On September 1, 2016 a Falcon 9 rocket was destroyed by an explosion that originated around the rocket's second stage while preparing for a routine static fire test on the SLC-40 launch pad. The explosion occurred during loading of liquid oxygen eight minutes prior to igniting the first stage engine as part of the test. A static fire is a test performed prior to launch to verify that both the launch vehicle and the ground systems are ready for flight. The test is identical to a launch until the moment of liftoff but instead of releasing the vehicle shortly after first stage engine ignition, the engines fire for a few seconds and then shut down. The second stage is fueled to test the interaction with the first stage and ground systems but remains otherwise inactive. After completion of a static fire test, the propellant and oxidizer are unloaded, the launch vehicle is lowered and the launch vehicle is returned to the hangar pending review and analysis of the data from the static fire test. Static fire tests are not common for most rocket launches and most proceed without one. SpaceX performs static fire tests to ensure that ground systems as well as the launch vehicle will perform nominally. The static fire explosion resulted in the total loss of the rocket. The rocket's payload, the Amos-6 satellite, was on-board and was also destroyed. In addition, the explosion resulted in extensive damage to the launch pad. It was reported to have cracked nearby windows and to have been felt up to 40 miles away. There were no personnel on the pad and no injuries from the explosion were reported. Repairs to and modernization of the launch pad began in early 2017 following completion of accident investigation and environmental cleanup. SLC-40 returned to service with the launch of CRS-13 on 15 December 2017. The pad was reportedly in good condition after the launch. The initial launch of a Falcon Heavy from pad 39A was contingent upon the successful reactivation of pad 40. Resumed launches from pad 40 freed up pad 39A for needed final modifications without affecting the SpaceX launch tempo. Wikimedia Commons has media related to Cape Canaveral Air Force Station Space Launch Complex 40. ^ McDowell, Jonathan (1998-02-22). "Issue 350". Jonathan's Space Report. Jonathan's Space Page. Retrieved 2009-07-09. ^ "Table 3". Retrieved 9 October 2014. ^ a b "Launch Complex 40". Afspacemuseum.org. Retrieved 2014-08-16. ^ a b Kelly, John (April 25, 2007). "SpaceX cleared for Cape launches". Florida Today. Archived from the original on September 30, 2007. Retrieved June 5, 2010. ^ "Falcon Heavy build up begins; SLC-40 pad rebuild progressing well". NasaSpaceFlight. Retrieved 22 April 2017. ^ "January 2 Anomaly Updates". SpaceX. Retrieved 22 April 2017. ^ "SpaceX launches and lands its first used rocket for NASA". The Verge. Retrieved 15 December 2017. ^ Hidalgo Whitesides, Loretta (May 1, 2008). "Launch Pad Demolition Clears Way for SpaceX Rockets". Wired. Retrieved June 5, 2010. ^ Shanklin, Emily (January 12, 2009). "SpaceX's Falcon 9 on Launch Pad at Cape Canaveral". SpaceX.com. Archived from the original on 2009-02-01. Retrieved June 5, 2010. ^ "NASA Selects SpaceX's Falcon 9 Booster and Dragon Spacecraft for Cargo Resupply Services to the International Space Station". SpaceX.com. December 23, 2008. Archived from the original on 2009-07-21. Retrieved January 26, 2009. ^ "Falcon 9's commercial promise to be tested in 2013". Spaceflight Now. Retrieved 17 November 2012. ^ Klotz, Irene (2013-09-06). "Musk Says SpaceX Being "Extremely Paranoid" as It Readies for Falcon 9's California Debut". Space News. Archived from the original on 2013-09-22. Retrieved 2013-09-13. ^ "SpaceX Anomaly Update". SpaceX.com. September 2, 2016. Retrieved September 7, 2016. ^ "Inside the $200mn AMOS-6 satellite destroyed during SpaceX rocket explosion (VIDEO, PHOTOS)". RT (Russia). 1 September 2016. ^ "SpaceX Anomaly Update". SpaceX.com. September 2, 2016. Retrieved September 3, 2016. ^ Klotz, Irene (2013-08-02). "SpaceX Appetite for U.S. Launch Sites Grows". Space News. Retrieved 2013-09-05. ^ "SpaceX Will Launch Another Used Dragon Capsule to Space Station Soon". Space.com. Retrieved 2017-10-30. ^ Bergin, Chris (March 7, 2017). "SpaceX prepares Falcon 9 for EchoStar 23 launch as SLC-40 targets return". NASASpaceFlight.com. Retrieved March 11, 2017. On the West Coast, three missions have set placeholders for launch from Vandenberg, namely Iridium 2 on June 17, the Formosat-5 mission on July 22 and Iridium-3 on August 24. Italics indicate unflown vehicles or engines and future missions or sites. † denotes failed missions, destroyed vehicles and abandoned sites. This page was last edited on 9 April 2019, at 13:18 (UTC).